How cool is this — yes, that’s a Dunder Mifflin banner hanging in front of Scranton City Hall! Although a fictional company, Dunder Mifflin is an official member of the Greater Scranton Chamber of Commerce, and took part last month in a banner campaign aimed at welcoming visitors into the city. Read more about the campaign here. Photo courtesy of our friends in Scranton, The Electric City. I bet Lynn Swann loves that public works employees hoisted banners “in preparation for Wednesday’s rally for Gov. Ed Rendell” who Swann aims to replace as governor. It would be just like Michael Scott to get Dunder Mifflin embroiled in a political scandal. Wonder if Jan will make the fines levied by the Bureau of Commissions, Elections and Legislation come out of his bonus. That right there? Is so.cool. I wish I had something more intelligent to say; alas, I do not. Wow, Dunder Mifflin in the house. 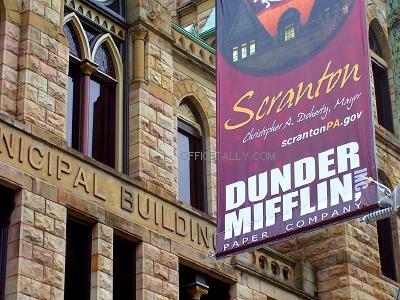 I’m really excited and a little surprised that Scranton would have banners of a fictional paper company up in front of city hall. It’s nice to see, though. Makes me wonder how the real companies of Scranton feel, I might be upset if I had been in scranton for 50 years, and some fake company had a banner in front of city hall. I’m a native of Scranton and this is awesome! My family owns Penn Paper and Supply company, the company the show is based off of, and we get so much publicity now plus everyone is so excited when we tell them how the cast comes to our store to do “the Office” conventions! Plus we were thinking of changing the sign on our warehouse to Dunder and Mifflin just for fun (it’s the first tower building they show in the credits). The last thing we are is upset. The shows popularity has really made Scranton kick itself into gear and try to better the city. Next PostNext Happy Birthday, Miss Angela!